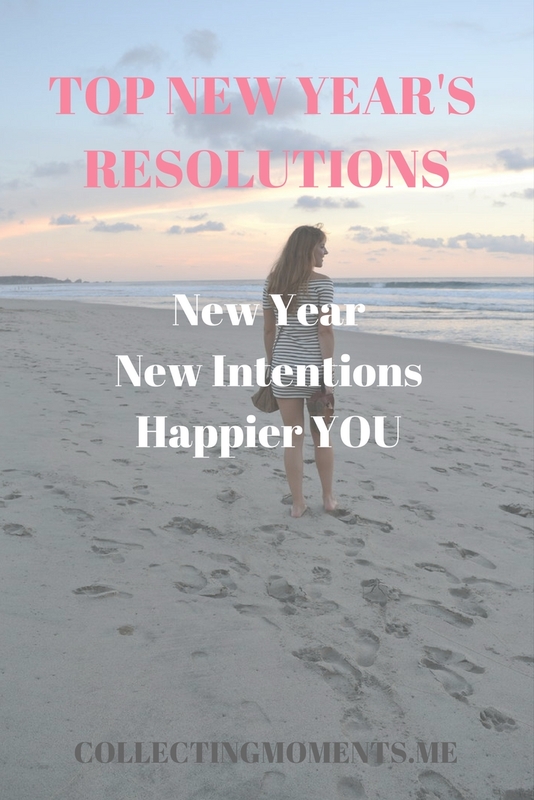 New Year, New intentions, happier you! Happy New Year everybody! I hope all your wishes will come true, you’re spending the first day of the new year with the people you love and most importantly, you’re feeling happy and satisfied with all the festivities. To get in the New Year’s spirit of positivity, I’ve decided to share my New Year’s resolutions in case we share the same goals for this new year OR to encourage any of you to pursue some new objectives and intentions this 2017! If you happen to be stuck on couple of changes you wanted to make, now is the perfect time to take a couple of minutes to reassess why you were not able to fully succeed, and write down new ways of accomplishing these goals and even new ones to follow. The following are the resolutions I’m going to practice on a daily basis this new year and I would love love love, absolutely love to hear any of your goals + tips on how to stick by them. I’ve always been a person that is constantly thinking about the future ~ What will I eat later? What will we do this weekend? What places will we travel to this year? Heck, even this post is thinking about the future lol, and of course there is nothing wrong with making plans, looking forward and having long-term goals! But, it is also GOOD to live in the moment, live the little things, the happy now! I’m making my biggest intention this new year to appreciate my day to day, be grateful for anything that happens throughout the day and to listen to my body and my surroundings better each day, and so that way not be so preoccupied with the future and actually enjoy the now. Something I love about yoga is having to set an intention for my practice that day! Having a purpose and intention for that hour makes me be more present (my #1 goal this year) and also grounded and accomplished if I’m successful with completing my purpose. This year, I will start the day (as soon as I wake up) with an intention for that whole day (i.e. be grateful, breathe more, drink more water, walk more, listen etc) and I will try to remind myself each hour of that one sole purpose, at the end of the day I will feel accomplished for trying (even if I don’t succeed) and will slowly become better at them and add more intentions for my day. I feel very accomplished in my fitness and health life this year! Yay! As I mentioned before, I finally found a workout routine I’ve been able to stick with (I’ve been doing Kayla Itsine’s Bikini Body Guide for eight months now!) BBG is now a part of my lifestyle and has encouraged me to be a better version of myself and nourish my body. This new year, I want to continue with my amazing workout routine and challenge myself to become stronger (lift heavier weights) and faster (finish the circuits at a faster pace)! Let’s do this #bbgbabes! The past year was great! I opened a blog where I get to write about things I love (such as this post), and I can’t wait to continue doing so this new year. I want to be able to grow a community where we can all motivate one another to have happy moments as often as possible! Traveling is my passion and all I wish for this new year is to travel wherever I can (even if it is 20mins away from home) and explore my surroundings, new environments and anything else out there! I tend to get caught up in all my day to day and often forget the importance of staying in touch with the people I love, reminding them how much I love them or simply just shooting a text saying hello so they know I thought of them. This year, I will try to visit my family and close ones more often. I love living in L.A. and every chance I get to travel, I like going someplace new. This year, I will make sure to remind myself quality time with the people is incredibly fulfilling as well and will stay in touch more! All of these resolutions will make me happier and very grateful, but also, I will practice and remember to worry less and just let go. If I don’t really follow a daily intention, or take as many chances as I wish I would, I will practice worrying less, letting go and not complaining, but instead I will remind myself of everything positive I do have and go back to my first and foremost intention - being present. Hope you like and can relate to one, some or all of my resolutions for this new year! Let’s keep each other motivated!